As time goes by, petrol pumps get dirty and look unattractive and unwelcoming from a distance. You can avoid this by opting for professional fuel pump cleaning. Whether it’s petrol, diesel or oil residues, dirt from the environment or stickers and graffiti, the fuel pump cleaning makes your petrol pumps sparkle like new, and signals your petrol station’s standards of cleanliness. Painted and unpainted surfaces occasionally require a polish. Even stainless steel loses its shine over time and quickly looks unsightly due to daily heavy use. You arrange the petrol station’s lighting so that the fuel pumps are visible from afar. Clean surfaces reflect the light and have a welcoming appearance, so that motorists would much rather drive to you and increase your turnover by filling their tank. For fuel pump cleaning, we only use high-quality and environmentally friendly special agents that do not pollute the groundwater and are completely safe. Your customers will be thankful for a clean petrol station and will express their gratitude by regularly refuelling and becoming a regular customer. Your station’s traffic flow won’t be affected by the petrol pump cleaning, because you can give us a date when the operation is low. Our team guarantees you high quality cleanliness and is your point of contact if you place importance on high-quality cleaning agents and passion for fuel pump cleaning. 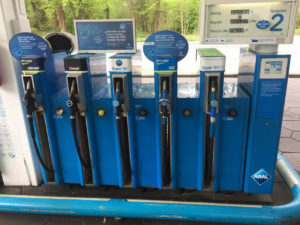 Petrol station operators and leaseholders can book the expert service for petrol pump cleaning and rely on fair terms for quality service and pure cleanliness. Clean fuel pumps show your customers that you care about ambience and value a respectable appearance. Dedicate yourself to your core business, while we take over the fuel pump cleaning for you and leave nothing behind but hygienic cleanliness. While refuelling, petrol and diesel can drip and run along the outside of the fuel pumps. The next customer to refuel may touch the contaminated area or dirty his clothes when he makes his way between the fuel pump and vehicle towards the shop. Youths leave their mark in the form of graffiti or stickers, which look unappealing and quickly create a untidy atmosphere. All these residues and other contaminants can be removed with a fuel pump cleaning. You can hire our petrol station cleaning team once or at regular intervals, and feel assured that we will complete your mission with expertise, high-quality and environmentally friendly cleaners and a passion for cleanliness. Contact us as a specialist for fuel pump cleaning. Mo.-Th. : 09:00 a.m. – 5:00 p.m. Fr. : 09:00 a.m. – 3:00 p.m.
We offer industrial and gas station cleaning throughout Germany and Western Europe. Through our regional route planning, we connect several places of work, so that travel and basic costs are divided into all customers on a pro rata basis. This gives you top performances on fair terms. Mo.-Th. 09:00 a.m. – 5:00 p.m.
© Tankstellenreinigung.net. Alle Rechte vorbehalten.